Whether you enjoy active water sports, like watching a gorgeous sunset over a beautiful lake, you love fishing, or you want to see a sunrise from your own window each morning, the wonderful waterfront of Austin and the Texas Hill Country has it all! Natural scenery at its finest!! Waterfront property is a limited resource that is very much in demand. To own waterfront property is a dream come true to many buyers. With our extensive knowledge of waterfront property and our expertise in this area, we will help that dream come true! 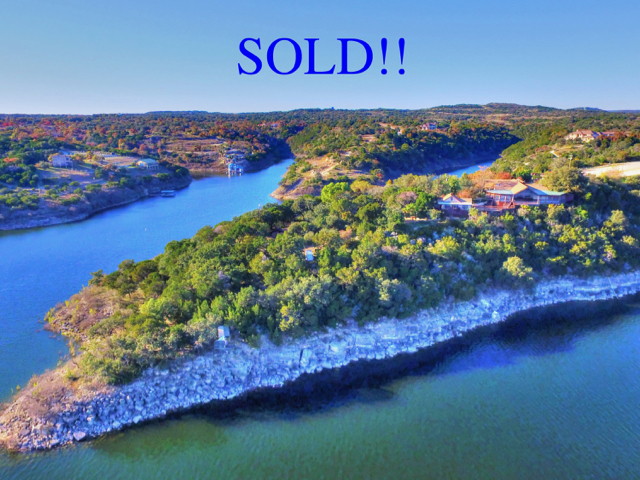 The most amazing home on Lake Travis with 360 degree panoramic views of Lake Travis. It has approximately 6,785 square feet, 5 bedrooms (two are masters), an office (can be used as a 6th bedroom), 7 full baths, 2 half baths, a pool shower, family room, formal living room, gameroom, media room, wet bar. . . and much, much more. The outdoor living area is gorgeous with swimming pool, spa, outdoor kitchen/bar, covered area, firepit and 360 degree views of Lake Travis. When considering the purchase of waterfront property on Lake Travis, you need to work with a real estate agent with waterfront experience. There is so much that needs to be considered when purchasing waterfront property, especially on Lake Travis. Lake Travis is not a constant level lake as the water fluctuates depending on the weather conditions and on LCRA management decisions. The elevation when Lake Travis is considered full is at 681' and the current flood stage is 715'. The highest level the lake has risen to was 710.44’ on December 25, 1991. The lowest level it has been was 614.18’ on August 14, 1951. 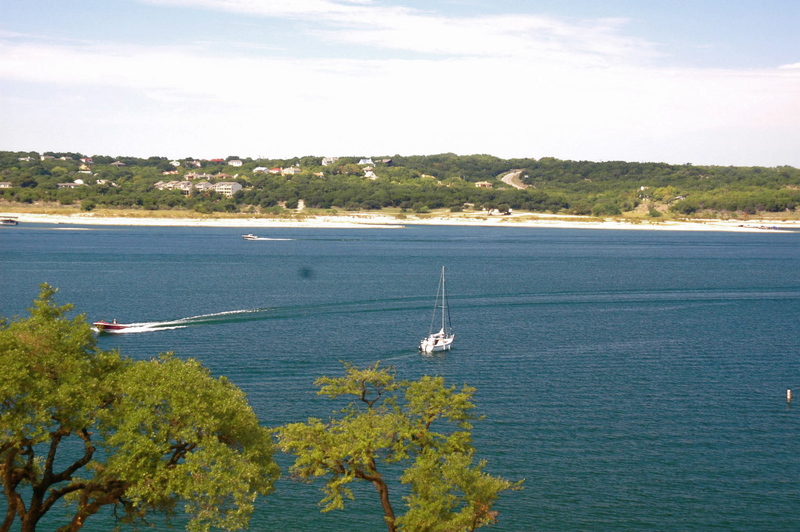 The average level of Lake Travis is 670'. Potential buyers of Lake Travis waterfront property need to know at what contour of the lake the property is on. It's important to know that when the lake is down, your boat dock is still floating on your property. You also need to be aware of the elevation of all improvements on the property. There are many homes around Lake Travis that were built in the flood plain. This information needs to be obtained and considered before closing. This neighborhood is situated on a hill overlooking the main basin of Lake Travis. Most properties have incredible lake views! This area has great deep water Lakefront property, as well as incredible lake view property. There are great waterfront properties with lake views located between Cypress Creek and Sandy Creek. Lago Vista is a beautiful community located about 20 miles northwest of Austin. It boasts of an abundance of scenery, wildlife and a relaxing environment. Lago Vista provides an enviable quality of life whether sailing on Lake Travis, hiking or biking in Texas Hill Country or enjoying beautiful sunsets. Lago Vista supports an active lifestyle offering opportunities for participation in theater, recreation, and many other options. It encompasses more than 15 miles of shoreline and is the gateway to the Balcones Canyonlands National Wildlife Refuge. Abundant white-tailed deer roam along the shores of Lake Travis and golf courses. There is year round golfing, boating, fishing and hunting. Jonestown is located at the north end of Lake Travis, 19 miles northwest of Austin. Most waterfront lots are cliff lots. The Village of Point Venture is located on a peninsula of Lake Travis 30 miles Northwest of Austin in the heart of the Texas Hill Country. Point Venture is popular for its many amenities that are offered to both owners and rental guests. These amenities include the Point Venture golf course, Jr. Olympic swimming pool, workout room, tennis courts, waterfront park and boat ramps, as well as a floating restaurant. 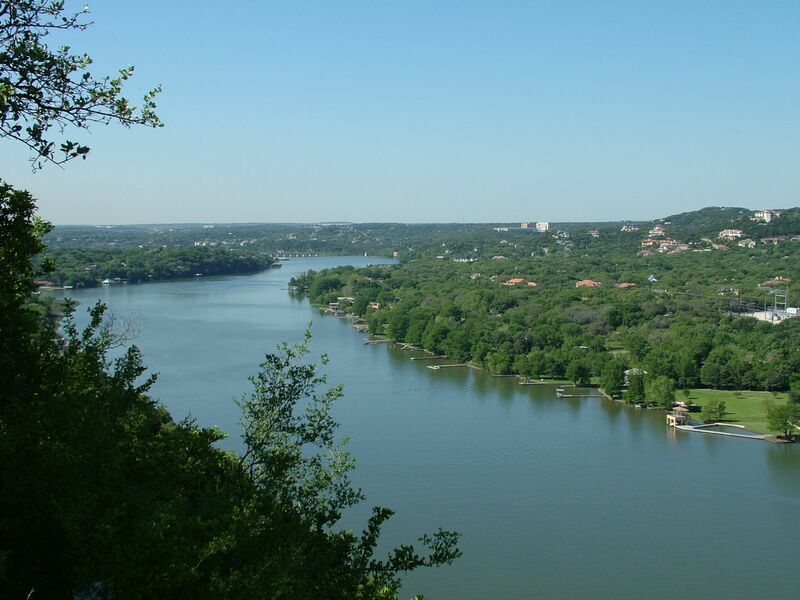 Lakeway is an incredibly beautiful city nestled in the Texas Hill Country and on Lake Travis. It is a thriving community with all of the amenities needed such as great shopping, dining, banking and entertainment options all within easy reach. Waterfront real estate from luxury estate homes to modest condos are available. With it being only 16 miles west of Austin via RR620 or FM 2222, it is an easy commute. Work in Austin, enjoy the live music scene, dine at one of Austin's fabulous restaurants, then come home to a stunning view of Texas Hill Country or Lake Travis. Spicewood--Located 22 miles NW of Austin and 16 miles SE of Marble Falls, Spicewood real estate is becoming more and more in demand. With its lake, creek and river setting in Texas Hill Country, it provides a scenic and natural environment that is great to call home! With its close proximity to Lakeway and Austin, there are endless things to do!! Briarcliff is on Lake Travis and Farm Road 2322, twenty miles northwest of Austin in western Travis County. Being on the cliff side of Lake Travis south shore, it offers beautiful sunsets, great watersports and is a fabulous place to live. Westlake Hills is one of the most prestigious communities in the Austin area. With its beautiful vistas of the city in one direction and gorgeous hill country views in the other, combined with exquisite homes, tree-covered lots, beautiful landscaping, and the award-winning Eanes School District, Westlake Hills has it all! Located only minutes from Downtown Austin and situated on the beautiful west bank of Lake Austin is the prestigious community of Rollingwood. Bordered by Lady Bird Lake, MoPac Boulevard and Westlake Hills, it couldn't be in a better location. It offers convenience, tranquility, beauty, safety and the best schools in the Austin area, which are part of the Eanes Independent School District. Some of the subdivisions include: Lake Hills, Austin Lake Estates, Lake Ridge Estates, Rio Robles, and more. The area is located West of Loop 360 just off of Bee Caves Road (2244), in the prestigious Eanes School District. Neighborhood Association membership includes access to waterfront park on Lake Austin with boat ramp, pool, and clubhouse. Most of these subdivisions are within a 20 minute drive to downtown Austin. Apache Shores is close to Lake Travis off of Hwy. 620 on the South Shore of Lake Austin south of Mansfield Dam. Community facilities include a boat ramp and docks on Lake Austin, pool, tennis courts, hike & nature trails. Apache Shores consists of more than 2,400 lots and over 750 homes. Apache Shores includes lots and homes with spectacular hill country, and Lake Austin views (as well as waterfront homes on Lake Austin). Undeveloped lots are still available. While on Lake Austin, it is close to Lake Travis. There are a few older subdivisions such as River Ridge and Lakeland Park and lots are still available. THINGS TO SEE AND DO -- Some of the tourist attractions other than water activites.There are so many activities that we cannot list them all! Here are a few! Visit the Falls on the Colorado Museum at 903 Second Street in Marble Falls. Call 830-798-2157. Take the walking tour of 27 historic buildings in Llano and enjoy the historic Courthouse Square. Ride horses at Colbert Ranch. Visit the Hill Country Wildlife Museum on the square in Llano. Call 325-247-2568. Climb Enchanted Rock 22 miles south of Llano on Ranch Road 965. Call 325-247-3903. Tour the Inks Dam National Fish Hatchery 12 miles west of Burnet. Call 512-793-2474. Take scenic drives through the hills and around the lakes in the area. Visiting the Fort Croghan Museum, located next to the Burnet Chamber of Commerce on Highway 29 about 1 mile west of Highway 281. Call 512-756-8281. Visiting the Highland Lakes CAF Air Museum - Headquarters for Confederate Air Force Hill Country Squadron. Call 512-756-2226 for more information. For information on Art Galleries - Click Here. For information on Museums - Click Here. For information on Antique Stores - Click Here. Visit here for Camping and RVing in the Highland Lakes Region. Check here for future events in the Highlands Lakes Area. Blue Bonnet Cafe.....Marble Falls, Texas. Visit the renown cafe voted in the top ten restaurants in Texas by the Texas Highways magazine. Cooper's Old Time Barbeque.....in Llano, Texas. Lake LBJ Yacht Club and Marina.....Located just east of Horseshoe Bay, Texas. Big John's Barbeque and Steak House.....Located at the intersection of Hwy 1431 and Hwy 29 a couple miles west of Lake Buchanan. The Oasis.....Located in Lakeway, Texas. FOR MORE PHOTOS OF THE AREA, PLEASE VISIT THE SITES BELOW.